Get ready for an exhilarating ride of a lifetime in DreamWorks Animation's The Road to El Dorado. 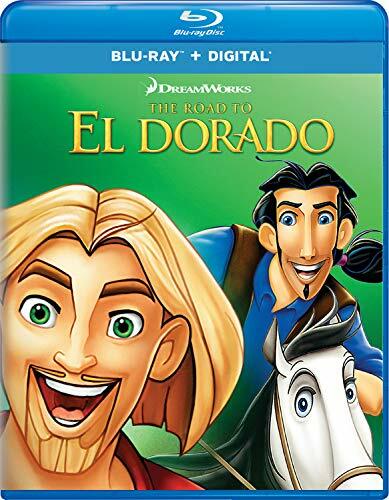 Join Tulio and Miguel – and their hilarious horse Altivo – as they set sail, map in hand, in search of a golden treasure. Upon landing on the shores of El Dorado – the legendary Lost City of Gold – the duo are mistaken for gods and are lavished with riches behind their wildest dreams. As friendship, loyalty and greed collide, our unlikely heroes must make the decision of their lives…run off with the gold or face unforeseen risks and dangers to save the people of El Dorado! Reuniting the Academy Award-winning musical team from The Lion King – Elton John, Tim Rice and composer Hans Zimmer – this colorful, glittering film features captivating songs, memorable characters and spectacular animation that will be treasured for all time.